PlastiPrint 3D is able to provide the following services and more. If you have an idea for a project but aren't sure how to proceed please get in touch. We are always happy to take on a new challenge! We have a range of different 3D printing processes available to us and can advise on the best 3D printing method for your parts. All 3D printing is carried out in house on our own 3D printers. 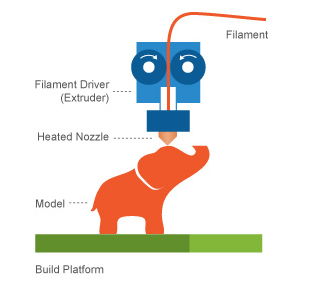 The FDM process extrudes a plastic filament through a precision hot nozzle much in the same way a hot glue gun works. This nozzle is then moved across a heated build platform to draw out each layer of the 3D print. The printer uses a set of precision stepper motors which allow us to achieve high tolerances and a superior surface finish on parts. We have a variety of materials available. In general FDM parts are strong and able to be handled without fear of damage. The SLA process uses a photosensitive resin which hardens to a solid plastic when exposed to UV light. The printer uses a laser to draw out and cure each layer of the print forming the solid object. Thanks to it's precision we have used this process to produce dental drilling guides with very fine tolerances. The materials available for this process include a standard resin, a tough resin and a high temperature resin. The tough material has properties similar to ABS and the high temperature resin can be taken to nearly 300 degrees celsius without significant deflection in the model. We have used this material previously in parts for a prototype clothes iron. The Colour Jet printing process uses a full colour print head and liquid binder / powder system. The powder is a gypsum material very similar to plaster of paris. The 3D printer lays a layer of powder down and the print head binds each layer drawing out the outline of the part in full colour. Vivid full colour 3D prints can be made using this technique. The finished 3D prints are then coated with a penetrent which both enhances the colour and improves the strength of the finished piece. The newest addition to our 3D printing offering is our Selective Deposition Lamination (SDL) process. This works by 3D printing with bonded sheets of recycled A4 paper. Once a sheet has been placed on the build platform, a knife cuts out the colour profile of the layer before glue is applied. A new sheet with the colour outline is then placed on top and the process repeats. This is the worlds only true colour 3D print process. We are thrilled as the process uses entirely recycled materials and the waste products are completely recycled as well. A true environmentally friendly 3D printing process! Using our 3D printers to model negatives or positives, we are skilled at creating silicone molds which can be made from industrial, body safe or food safe silicones. Previously we have created food safe molds for a chocolate producer, industrial grade silicone O-rings which were custom to the clients specification and props used in the theatre using a variety of different materials. At PlastiPrint 3D we not only have a wide range of experience 3D printing but also in radio control, low voltage motors and control, custom fabrication, design and much more!